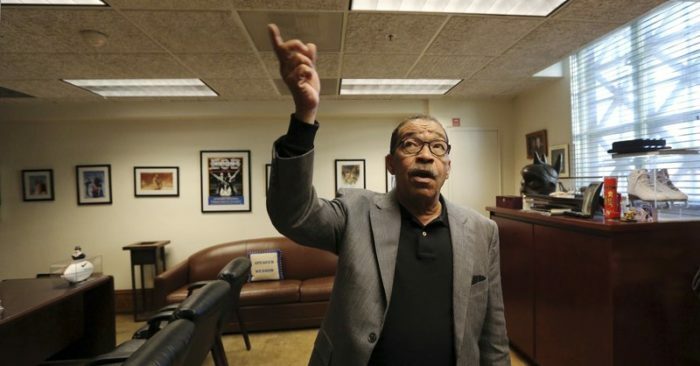 The first clue Los Angeles City Council President Herb Wesson had that rats were invading City Hall, possibly carrying a potentially deadly disease, was the pitter-patter of little feet. Now, after learning that an employee in another City Hall office became infected with typhus around the same time, he has asked the city’s staff to examine how much it would cost to remove all the rugs in the 91-year-old building and its City Hall East annex. Wesson acknowledged he hasn’t actually seen a flea-bearing rat in his office but he’s talked to enough people at City Hall to have no doubt there are plenty of them there. In any case, something was definitely chewing on his potted plants before he removed them on the advice of exterminators. “We had a lovely orchid right there,” he said pointing to an empty plant container. On Thursday City Hall docents, security guards and employees in several other council offices said they haven’t seen any rats either. But they also don’t doubt they are there. “When we’re working late in the office sometimes you hear something in the wall,” said Mark Pampanin, communications deputy for Councilman David Ryu. Wesson says he doesn’t know how much it might cost to replace all of the 27-story building’s rugs, some of which are decades old. But he doesn’t plan to replace his at all. He had the original concrete floor it covered polished and says he and his staff love the new retro-LA look that’s perfect for an iconic building. That history is one reason the folks around the corner at Ryu’s office said they pulled their rugs after the councilman took office in 2015, years before the rat problem began.